It was the official hashtag for the church wedding of Cong. 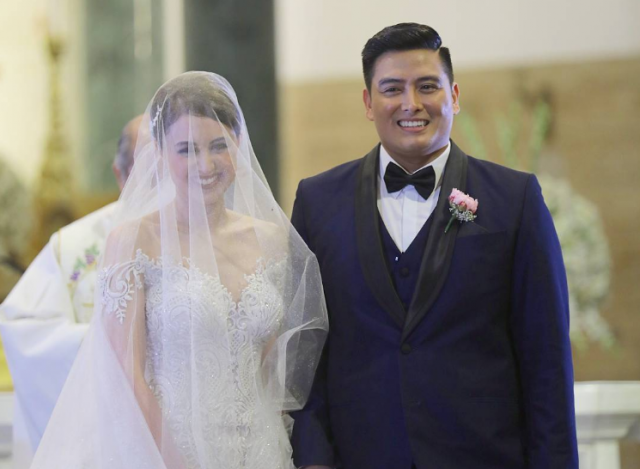 Alfred Vargas and his wife Yasmine that took place at the Manila Cathedral earlier today. The reception was held at the Manila Peninsula Hotel, where guests were wowed by the setup and all the wedding details. Wedding cake for Alfred and Yasmine Vargas #vargasnapagibig . Over a thousand hand made gumpaste sugar flowers, arranged on a 7-layer 7ft tall cake. Of course, the wedding was also packed with big-time guests. These included celebrities and well-known public servants. The couple first tied the knot in a civil wedding in 2010. Last year, Alfred surprised Yasmine with a proposal. Yet, this time, for a church wedding.